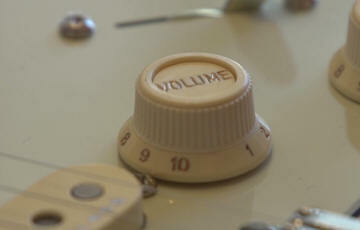 The Fender elite Stratocaster volume knob is particularly slack and easy to knock. Here's how to fix that problem without any modifications to the guitar. When I bought the Fender elite Stratocaster I was immediately impressed. Check this review on my website for the lowdown. But me? a Stratocaster player? well it's a love/hate relationship and for just one reason. 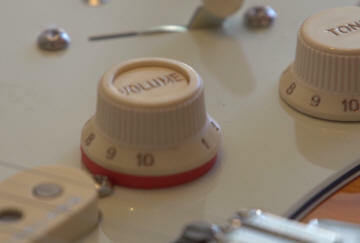 Because I play Ibanez, Gibson and other brands it can be hard for me to not 'knock' the volume knob on the elite Stratocaster - somehow it's just in the wrong place - and sometimes its exceptionally loose. Indeed, on some of the guitars I have made Stratocaster style I have even been known to 'leave off' that top volume knob and use the second one down as a volume. But in the case of the elite (and many other Stratocasters from Fender you get what you get right? And there's one glaring stand out feature that makes the elite even harder work for me - and maybe loads of guys just like me. 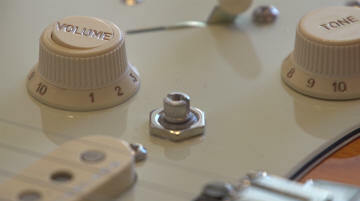 The fact is, that the volume knob itself has a neoprene (or rubber) surround where the sides of the knob are - you see them above. So getting to grips with that knob is better than ever... or not if you're like me! 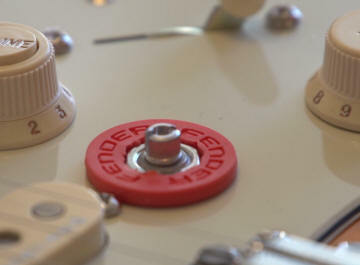 And to make matters much worse, that knob has virtually zero drag, you can flip it around with just one simple knock. Now if you ever are playing and you even back off the main volume from 10 to even 9 then that has on a Stratocaster a massive difference especially when playing lead guitar. It's always been that way, but there was much more drag which in some ways 'helped' to keep the volume where you set it. So I gave this problem some thought and came up with an answer that stops this knob getting knocked - and there is nothing in this modification that harms your guitar in any way, it's reversible in around 30 seconds! Firstly, I was scanning around for a neoprene washer that could fit under the volume knob and I came across these Fender strap locks. While these are thicker than what I really wanted (more on that later) I decided to get a set at Fender prices (ouch) and see what I could do. As you can see from the photo above the nut is around 13mm or 1/2 inch. 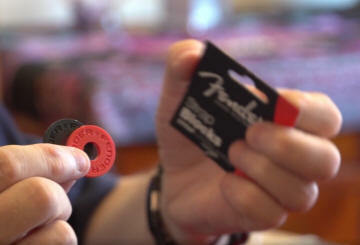 But the Fender washers have a smaller centre hole. Firstly cut the washer internally until the washer will fit over the nut that holds the pot in place as follows. OK so far... Now I did say that this washer is thicker than I would have liked. Later I found one of those coloured door key covers that was the same material so I cut that in half and that worked perfectly with the advantage that the volume knob was further on the shaft - but the one above also works fine too. Because this washer is a sort of neoprene rubbery material it tends to grip much better than say 'felt' or similar materials (others recommended felt but it really is not as effective) and offers at least for me the perfect amount of grip for the volume knob so that it simply does not get knocked no matter how much I tend to hit it while playing. The finioshed project is a pretty good solution for this volume knob slackness on the Fender elite and also works on most other fender guitars. If there's no S1 switching it's even better! Do bear in mind what I saidf about other washers - all OK if they are thinner but use the neoprene type of washer to ensure that the knob has that 'stickyness' that will ensure the next time you play you won't be suffering from the volume knob blues. Here is the video review I completed from my YouTube channel that shows the complete operation of how to do this simple modification.